Printed by B. Dondorf in Germany. The Carreras Fortune Telling Cards were published in 1926 for W.D. & H.O. Wills, Bristol, and issued by Carreras Ltd in various sizes (wide and narrow size) and formats (playing-card inserts or figures). 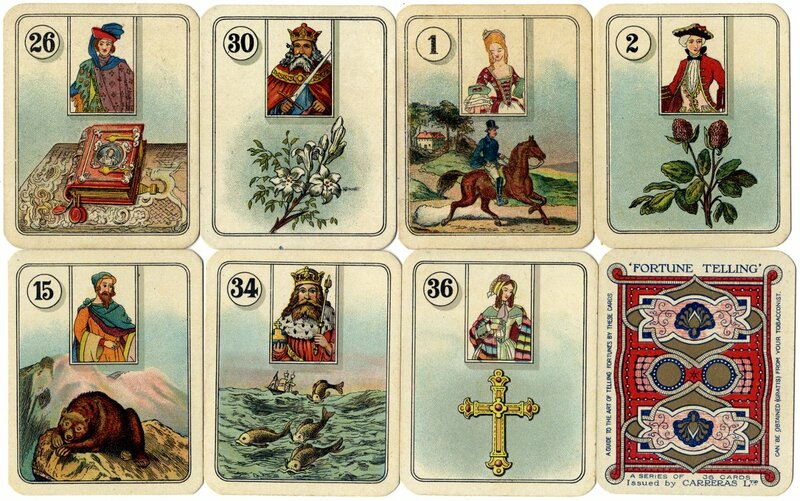 The cards were printed by chromo-lithography by B. Dondorf in Germany, based on the Dondorf Lenormand fortune-telling cards made in the 1880s. 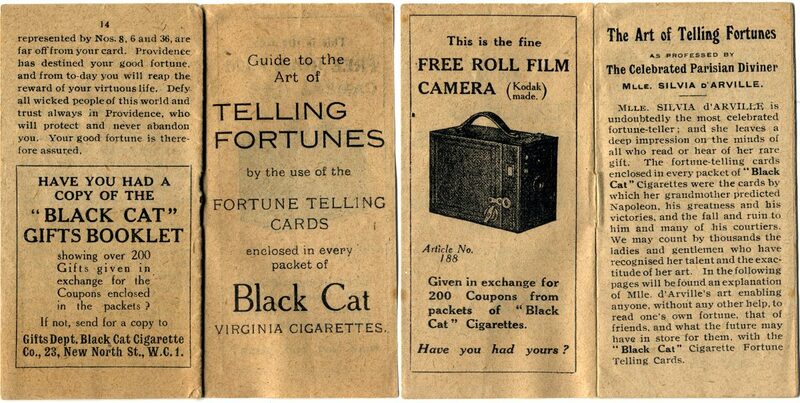 A single card was enclosed inside every packet of Black Cat cigarettes. Black Cat was launched in 1904 and became the first cigarette in the United Kingdom to contain coupons which were redeemable for gifts. These coupons evolved into the collectible cards which became a huge marketing success. See also: Wikipedia article • Cartes Lenormand by H.P. Gibson • Mlle Lenormand Fortune Telling cards by Vereinigte Stralsunder Spielkartenfabriken. Above: Carreras wide-sized Fortune Telling Cards with miniature playing card inserts, 1926. A single card was enclosed inside every packet of Black Cat cigarettes and in this case two missing cards have been made from repeated cards to complete the set. Above: Carreras wide-sized Fortune Telling Cards with figure-head inserts, 1926. 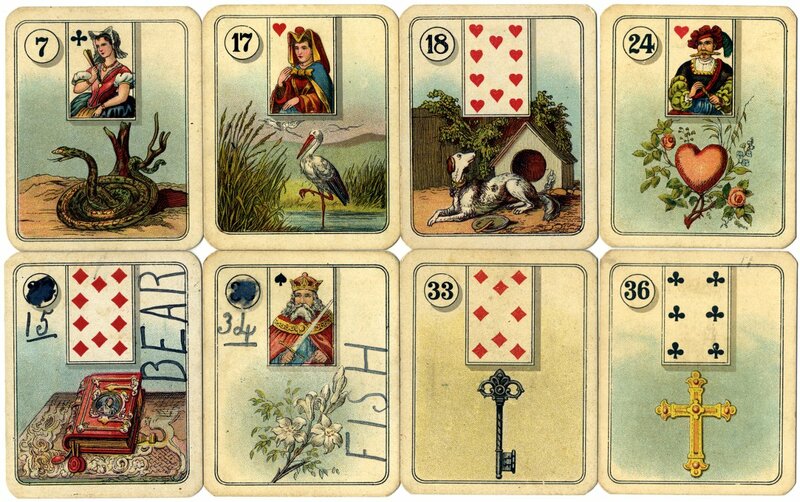 The fortune-telling images are exactly the same as in the example above, but in this case the miniature playing-card inserts have been substituted by figures. As far as we know the interpretations in the accompanying booklet remained the same for both versions, i.e. with figure inserts or playing card inserts. Carreras also issued Domino Cards, Alice in Wonderland cards and miniature playing cards. See also: Fortune Telling & Cartomancy :: Cartes Lenormand by H.P. Gibson.